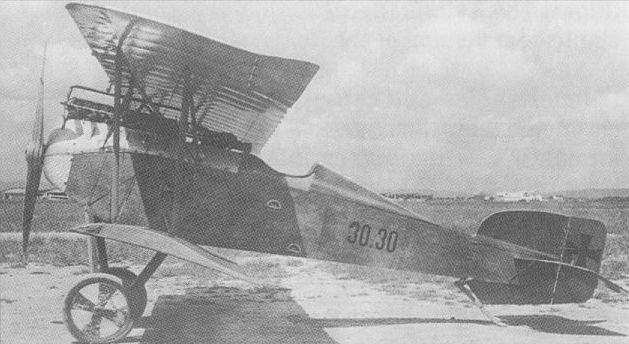 Developed specifically for high altitude combat over the Italian front, the Aviatik 30.30 (which has sometimes been referred to as the D III although no evidence exists to support the application of this designation) had wings similar to those of the D I, married to a new fuselage, redesigned vertical tail surfaces and a 230 hp Hiero six-cylinder inline engine, the radiator for which was mounted above the upper wing centre section. Time to 3,280 ft (1 000 m), 2.17 min, to 6,560 ft (2 000 m), 5.1 min, to 9,840 ft (3 000 m), 9.1 min. Empty weight, 1,506 lb (683 kg). Loaded weight, 2,079 lb (943 kg).